Why can't runway 18 at Frankfurt Airport accept takeoffs or landings in the opposite direction? 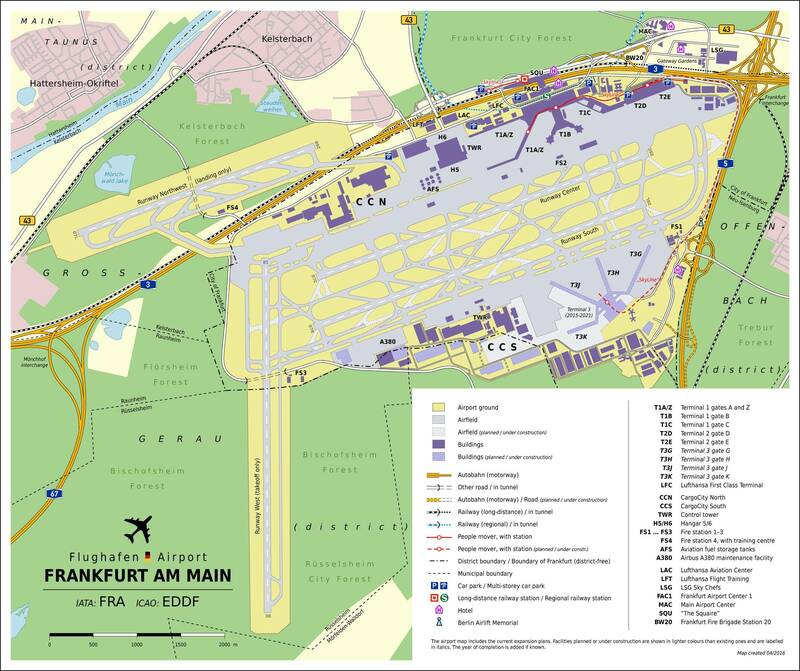 Runway 18 at Frankfurt Airport is one example of a runway which is numbered on only one side. Aircraft can only takeoff in the 18 direction, and cannot takeoff in the 36 direction, nor land in any direction except in an emergency situation. Let us consider the operations other than takeoff on runway 18. There are buildings not far off the departure end and directly after the end of the runway is a movement area and ramp. To safely takeoff they would have to clear that area and probably replace all the concrete with crushable concrete (more on this later). The buildings probably post obstacle clearance issues for engine out climb performance. The east-west runway north of 36 would have conflicting traffic and would have to be carefully sequenced. Lastly, that purple area to the north of the runway is probably a noise sensitive area you aren't allowed to fly over at low altitude. You approach over a noise sensitive area, cross over operations on the northern east-west runway, overfly a building at extremely low levels (wheels on the roof) and have to make sure there are not airplanes on the ramp between the building and runway. Landing short would be nothing short of disastrous and every landing would be a risky operation with the close proximity of airplanes and buildings. Glideslope services would probably not be available due to ground obstacles. This is the least problematic approach. The problem is in missed approaches and long landings. There is no safety area at the end of 36 and a runway excursion past the end of the runway would be catastrophic. To mitigate this they could re-pour the ramp concrete with crushable safety concrete, but that would probably make using ramp and building unsuitable. If traffic goes around they conflict with aircraft on the northern east-west runway and have a noise sensitive area to deal with. In comparison to the above, taking off to the south only requires a blast fence just north of the runway to protect the ramp and building from jet blast. There are no logistic issues in aircraft movement on the ramp and the building is not in danger of being hit. looking at the chart, you can see buildings right past the treshold on the opposite end. Taking off to the north (or landing from the north) would put you dangerously low over those buildings, not a safe situation at all. Also, there are no doubt very strict noise restrictions in place which ban overflights of the towns and city districts just north of the airport, further restricting the usefulness of maintaining navigation aids and other things needed to make it an operational runway in both directions. If you see the runway orientation, it is clear that any landing in the runway 18 (Runway West) will interfere with air traffic in the other runways (Runways North, 07C/25C and South, 07R/25L). The same thing goes for takeoffs to the north in that runway. This is the reason the runway is used only for takeoffs in southbound direction. Not the answer you're looking for? Browse other questions tagged landing takeoff runways or ask your own question. Why does Logan Airport's Runway 32/14 only have arrivals on the 32 heading? How are arriving aircraft assigned to runways? Was the runway upgrade at Mataveri Airport on Easter Island really related to the Lee Correy novel “Shuttle Down”? How can I calculate which runway to use for landing, based on the wind?